It's no mystery why Donald Trump is popular; he's managed to mine the misery of the GOP's older white middle class men and turn it into votes thus far. No one knows what Trump will do if he's actually elected president. That's because even Trump doesn't know what he'll do. How did a guy just as obnoxious as The Donald ever get elected as Maine's governor? Whoever voted for him is probably regretting their decision by now. 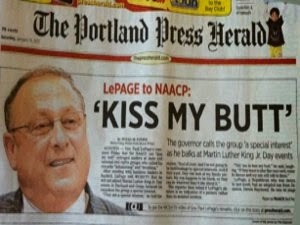 Governor Paul LaPage is the most racist, insensitive state governor in America. Is this what the voters expected when they elected him? That was LePage in 2011 dismissing concerns about the chemical BPA in plastic bottles. "The minute we start stifling our speech, we might as well go home, roll up our sleeves and get our guns out." That was LePage fuming after he was barred last May from speaking at a state Appropriations Committee meeting. Maine State Sen. Troy Jackson "claims to be for the people, but he's the first one to give it to the people without providing Vaseline." LePage said this in 2013 after Jackson gave the Democratic response to the governor's budget veto. "If you want a good education go to private schools. If you can't afford it, tough luck. You can go to the public school." Meanwhile, if you think LaPage has been the poster boy for bad taste and racism, stop and think about what Trump would be like. He's already further divided an uneasy country with his racist rhetoric in just the primaries. Worse, we haven't seen his whole act yet.